Kali Katerberg/Daily Mining Gazette Ontonagon Sheriff Dale Rantala requests staffing changes to the department at the Tuesday board meeting. ONTONAGON — With openings and a departure, the Ontonagon County Sheriff’s office is pushing to fill openings and reworking positions. Former undersheriff Gerald Balcomb resigned from his position to take a position out of the area, leaving Sheriff Dale Rantala in need of a replacement. Turning to local talent for the position, he proposed Jason Clinesmith eventually fill the role. 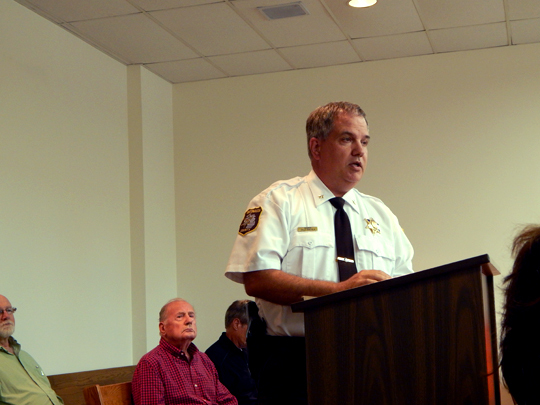 “I think he’s going to be an excellent undersheriff,” Rantala said. However, Clinesmith can’t currently become the undersheriff as he is a corrections officer. With that in mind, Rantala would like to see Clinesmith serve as jail administrator taking over the everyday operations of the County jail. Long term, he would go to the Northern Michigan University Region Academy to get his Michigan Commission on Law Enforcement Standards (MCOLES) certification in May of 2019. Once certified, Clinesmith would be qualified to serve as undersheriff. Until then, Bill Witt will fill the role of undersheriff. The change leaves the department with three vacancies, one for a corrections officer after Clinesmith’s new direction and two for vacant deputy positions. The police academy graduated Monday so there may be new officers looking for jobs in the area. Rantala has had three express interest. The board unanimously approved the sheriff’s recommendation and authorized the posting of the vacancies.